I have one silly one, and one serious one. So much about this song cracks me up, but my favorite is singing along with the background singers. And, it makes me want TX MX food…which we pretty much live on here in Texas anyway! YUM! Side story – We were visiting friends in Florida (NY natives) a few years ago and she said, “What are those things called again that you buy instead of bread?” Um, that would be tortillas. We’ve laughed about that ever since. While I’m sure this doesn’t make everyone’s top 10, it holds a special place in my heart. I was dreading the first Christmas without my Mom. It just wouldn’t be the same without that precious lady that all of us intensely adored and who had the magic of making the holidays sparkle even brighter. When it first started rolling through my brain, I had to stop and think which Christmas carol it even came from. This gift from God helped me through that first Christmas and has been a blessing ever since. We may say that “God is good, all the time. All the time, God is good.” But nothing proves that more solidly than suffering. He IS our comfort AND joy. What a beautiful pairing of words! Do you have favorite Christmas songs, silly and serious? Are you like me and realizing you haven’t taken the time to tell you children why the serious one is special to you? Let’s take a moment this Christmas to enjoy a family dinner or drive-time conversation about everyone’s favorite Christmas carols. Maybe it’s not hugely emotional like mine, but rather fun memories associated with it….or even just the tune. Talk about what Biblical truths shine through your favorite carols. 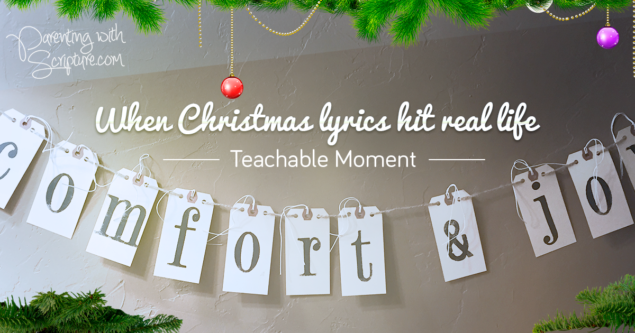 Discuss how God works through carols lyrics in our hearts and can also be a light to others. Take time to pray for the those who don’t know Him to hear the carols in a new light this year. May the truths sink into all of our hearts and souls. One of my dearest friends made this banner. It warms my heart and soul every time I pull it out with my Christmas decorations. For more teachable moments, refer to Parenting with Scripture: A Topical Guide for Teachable Moments.